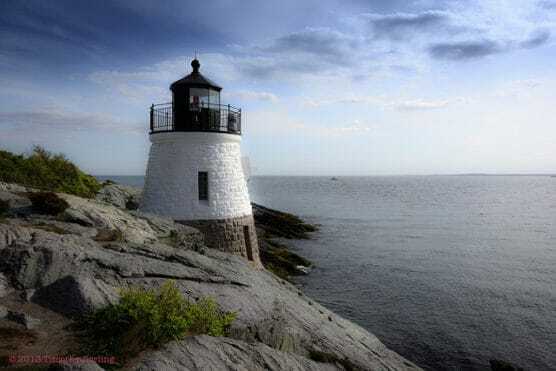 The beautifully scenic rocky coastline of southern Rhode Island forms the backdrop for this race, which takes runners on an out-and-back course along this town on Aquidneck Island and features views of the water for nearly the entire race route. From the starting line on Easton’s Beach along Memorial Boulevard, the USATF-certified course for the half marathon takes runners south along Annendale Road, and past Bowen’s Wharf and Waite Wharf through downtown. Runners continue heading south along Annendale until they reach Narraganset Avenue, where they turn right and head out along the peninsula-like land formation that juts out into the sound. The race makes a detour from Harrison Avenue northward into Fort Adams State Park, home to a historic 1812-era fort and the town’s annual Newport Jazz Festival and Newport Folk Festival. After reaching the turnaround along Fort Adams Drive, runners head back southward through the park and then turn right again onto for a brief stretch past the Newport Country Club, one of the founding golf courses of the United States Golf Association and the site of the first-ever U.S. Open and U.S. Amateur golf championships. Once past the course, runners continue heading south around the western edge of the island, down along Ocean Avenue towards the southern edge of Brenton Point State Park, which features views of the Rhode Island Sound to the south and Narragansett Bay to the west and north. Runners head around the end of the island along the green, grassy tree-lined shoreline along Ocean Avenue, crossing a bridge just after Princess Cove Avenue on their way toward Bellevue Avenue, which turns northward and begins the final stretch of the race up toward the finish line on Memorial Avenue, overlooking Easton Pond. Though the race features some uphill and downhill stretches, much of the course is run along even, flat terrain, and the race is run on paved surfaces throughout. Nestled along the coast of Rhode Island, about 30 miles south of Providence on the Narragansett Bay overlooking the Rhode Island Sound, the city of Newport typically experiences moderately cool to sometimes cold weather in the early fall. On race day (Oct. 13), the average low is 49ºF and the average high is 63ºF. See the race route map for the Newport Half Marathon. To reserve your spot in the 2019 running of the Newport Marathon or Half Marathon race, register online at EventBrite.com. Ever run in the Newport Half Marathon? Share your impressions here, or post your review in the Comments below.